Over the weekend, we saw the CSU suffer in Bavarian state elections as it lost its absolute majority, though it still won the biggest share of votes (see bar chart). Large gains were made on the left by the Green Party (who came second) and on the right by the AfD (who came fourth and now enter the State parliament). 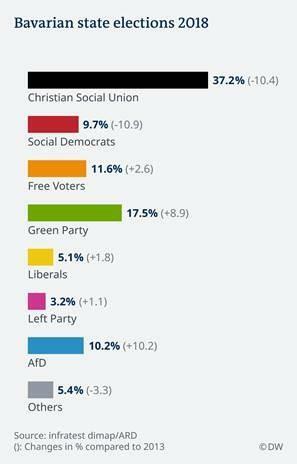 The Social Democrats (SPD) were the biggest losers, which continues the trend from the Federal elections in 2017. Current political calculus suggests a coalition between the CSU and the Free Voters, who came third. The Free Voters are made up from many former CSU politicians and position themselves as a protest party and in favour of rural and local issues. One takeaway is that the trend away from establishment parties continues in Europe. Another is that local and national interests are dominating over international interests (a potential negative for EU-Italy negotiations). The bigger question for the macro community is what this means for Chancellor Merkel, the relationship between the CDU and CSU and the dynamics within the grand coalition with the SPD. At one level, the CSU has been critical of Merkel, and the weekend’s results could provide a boost for her. However, we get the next state elections on 28 October (Hessen), where the CDU will stand, and if the results are poor there, then this could bring renewed pressure on her. As for the grand coalition, given the heavy losses faced by the SPD, it will need to consider whether remaining a coalition partner still makes sense. A potentially negative course for markets would be for the coalition to break down and new elections to be called. As a reminder, the euro fared poorly after the inconclusive election results of the 2017 Federal elections and during the initial coalition talks with the FDP and Greens (see chart). So far the euro has fared well today, but we need to keep a close eye on developments and need to add Germany to our growing worry list (US stocks, Fed hikes, US-China trade/tech war, Italy, Brexit…).